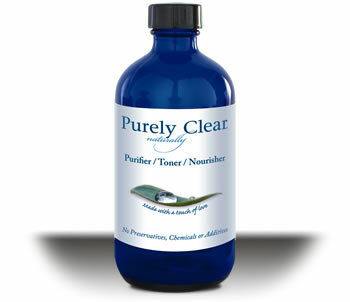 Purely Clear contains a proprietary blend of essential oils combined with high technology processed oxygen, minerals and other beneficial nutrients. Essential oils have been used throughout recorded history in basically every culture in the world in the pursuit of beauty and health. Science has confirmed that essential oils absorbed through the skin not only nourish the skin but also bodily organs and glands. The time-proven ingredients in Purely Clear have been shown to be beneficial in the treatment of: acne, rosacea, psoriasis, eczema, seborrhea, dermatitis, age spots, fine lines and wrinkles, rashes, poison ivy, scars, stretch marks and toning and tightening the skin. A precision proprietary blend of Purified, magnetized, glacier water, Aloe, Rosewater, MSM, Witch Hazel, Lavender Oil, Tea Tree Oil, Pure Silver, Ionic Silver, Dead Sea Minerals, Grape Seed Oil, Neem Oil, Tamaru Oil, Squalene, Grapefruit Seed Oil, Ionic Zinc, Ionic Sulfur, PCA, Carrot Seed Oil, Frankincense Oil, Neroli Oil, Sandalwood Oil, Emu Oil, Colostrum, Lactoferrin, Beta Glucan, Vitamin E, Vitamin A, Bergamot Oil, Red Myrtle Oil, Roman Chamomile, Cedarwood Oil, Ionic Selenium, Rosemary, Lemon Oil, Sea Buckthorn Oil, Eucalyptus Radiata, CoQ10, Evening Primrose Oil, Seaweed Extract (with naturally occurring plant aminos, enzymes, and minerals), Stabilized Oxygen.